A new variation on an old theme. Godforsaken Direct takes what is arguably the natural line of Godforsaken Land, combining Great Game into Godforsaken Land via two new pitches. The plumb line on this side of the cliff, forsaking the awkward and inelegant bolt ladders of the original Godforsaken Land. The climb punches up the centre of cliff via four high quality pitches on excellent stone. An elegant line that shouldn’t be missed! History: Both The Great Game and Godforsaken Land were developed by Robin Barley and Pete Shackleton in 1985, an era described by Barley as “the time of subterfuge and intrigue at Squamish with various parties trying to establish routes in secrecy” . Awesome positions on pitch 4. 5.10d. In 2000 Andrew Boyd and Mike Mott freed Godforsaken Land at a grade of 5.12-. Boyd was the boldest Squamish climber of his generation, with many test pieces to his credit. The free ascent involved difficult and insecure climbing that was out of reach of the bolts in several sections. This made for runouts and dangerous climbing in the midst of some of the hardest sections. The ascent was likely a casual ground up in day affair with no intention of creating a popular, repeatable route. Boyd certainly had a penchant for bold climbs his free version was probably just fine for him the way it was. The resulting free version of Godforsaken Land is most likely unrepeated. Upon realizing that we coveted the same line Tom Wright and I laid plans to establish new direct line on the cliff. The concept was to capture all the best parts of Godforsaken Land linked together with two obvious unclimbed features. The first pitch of Great Game seemed like the natural starting point as it would land us at the bottom the integral gold dihedral. We were stoked to discover that the slammed shut lower dihedral had a variety of usable holds and would check in at a grade that wasn’t too far out of character with the other pitches. On the next pitch we opted for an obvious undercling that we felt made for a much more natural line than the awkward A0 bolt ladder/ V5 boulder problem which forced directly up an overhanging prow. This variation landed us back on line where we were able to finish up the wild final pitch of Godforsaken Land. photo topo . click to enlarge. 5.10c, 40m. The first pitch of Great Game. Ascend left trending layback ramp to a typical Squamish finger crack/traverse crux followed by straight in hands. 5.12a, 40m. Finger traverse and mantle directly into the vertical, gold corner. Sustained, technical climbing persists past closely spaced bolts, as the angle kicks back a final exciting 5.10+ crux returns you to the corner whereupon a finger crack opens up in the back allowing for 20 meters of pleasant romping to a well crafted belay ledge. 5.11a, 25m. 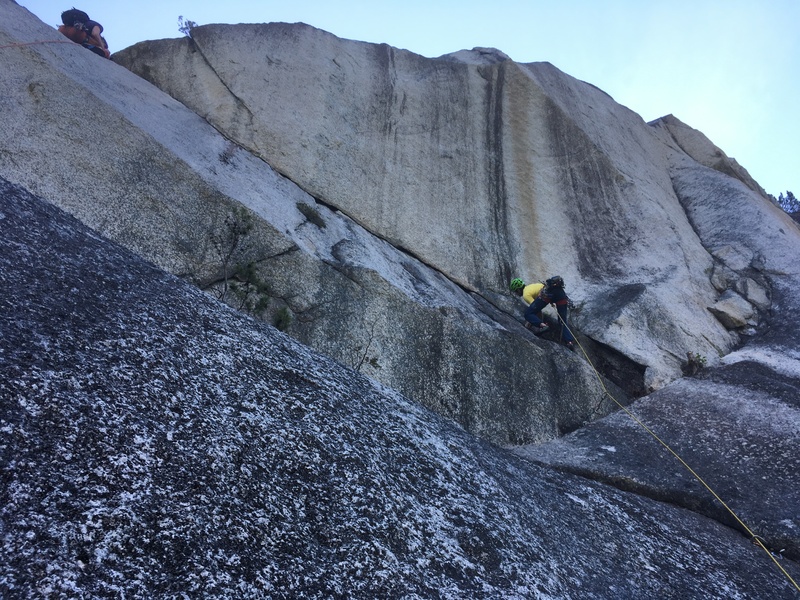 Move right and up flake to access an undercling crack that divides the steep headwall, positve grips and decent feet lead back left, just as climbing starts to feel desperate positive incuts appear that lead you to the arete. A final crux bulge on dueling finger cracks leads to small belay stance. 5.10d, 35m. Continue up curving crack across slab into main corner system skipping an intermediate anchor. Climb into the base of the obvious beak flake, make committing and exposed moves right into an offset corner system. Steep, wild moves lead to an awesome overhanging, juggy traverse finish. Solid for the grade and one of the best 5.10 pitches in Squamish. Crux section of pitch 2. 5.12a. Rack: A single set of cams to #3 BD and nuts, 2 x #.4-1 BD. Descent: Walk off or rappel. Although you can rappel Godforsaken Land with two ropes or a single 80m rope the best single rope rappel lines are via Chickenhawk, with a single 70m rope, or Flight Simulator with a single 60m rope. Big thanks to everyone who gets stoked on our new climbs and continue to encourage us. Much gratitude those who have contributed some of their hard earned dollars the Sea to Sky Route Development gofundme campaign. Funds go directly to high quality bolts and anchors used on routes such as this.